This hike begins at the Dog Mountain parking area along side State Hwy 14. Because of the length of this hike, and because of the cumulative elevation gain, this is a very difficult hike. Having said that, I must also emphasize that this hike is rich with rewards. The trail starts out in a steep climb which it never really moderates until it reaches the saddle on the western flank of Dog Mountain. The trail wanders in and out of heavily forested areas, affording you many significant views of the Columbia River Gorge and surround terrain. In season this hike is extremely floral for which Dog Mountain is famous. Well, Augspurger is also extremely floral in the late spring, and this is much of the reward for climbing it. After about 2.8 miles you will come to the junction of the Dog Mountain Trail. Keep straight ahead and descend on the Augspurger Mtn trail into a small valley. You will loose about 400 feet in elevation, that you will have to reclaim on your way back. There is another section of trail like this at the very end of the hike. As you follow this trail down the mountain and cross a small valley, the trail then begins to follow an old roadbed. This will take you uphill and under a major power line. Just keep straight ahead. Continue to follow the roadbed trail until you come to the first major corner. Here you will see the trail take off into the forest. Follow it. In a ways the trail will begin to curve to the west then climb up the side of a ridge. It will then curve back to the right and out into the open. From here on you will be able to enjoy a variety of views as you continue to climb Augspurger Mountain. In season the floral displays along this part of the trail are as good as they get. The first half of June is a perfect time to hike this mountain and enjoy all the many floral bouquets. As you climb up this ridge line, you will soon be looking down on the power lines that you hiked under a ways back. The trail gets steeper as it nears the summit, and the views south toward Mt Hood just get better and better. There are times when the trail wanders into the forest, but it is often out in the open. 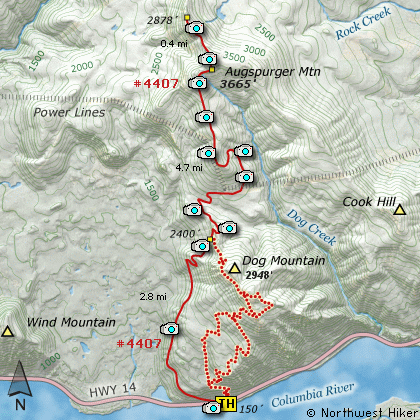 When you reach the highest ridge line, the trail follows that up to the densely forested top of Augspurger Mountain. If you follow the trail to the left, you will find yourself descending onto another ridge to the northwest of the main mountain. If you follow this ridge trail you will treated to exception views of the Columbia River Gorge, Mt St Helens, Mt Rainier, and Mt Adams.